When I saw a picture of vanta black, my initial reaction was to interpret it as a hole, so there is nothing surprising about achieving this with a hole. I can’t imagine breathing carbon nanotube dust is going to be great for you either. Possible carcinogen, depends on the exact diameter and length of the nanotubes, even the end caps or lack thereof. I’d pass on that without a 100% valid MSDS for the item. I was tempted to back this just to have a little piece of some of the ultrablack material as a display piece, but the kickstarter project hardly goes into any detail about what it is and how it’s made – suspicious flag #1. Had I seen this some years ago, I’d totally backed it up. But now with reports of all kinds of mischief with kickstarter it looks way too suspicious for me. Too sad, I like the product they offer. As to how the creator of the kickstarter is doing it could be viewed as “private” (he could just be buying carbon nanotube from a science materials supplier, sticking on a thin dusting to some plastic and putting on a massive markup in price compared to the cost of materials+labour). doesn’t work that way i’m afraid. the “carbon nanotube array” has to be grown on the surface so all the nanotubes grow vertically like a forest. light gets trapped within this forest and adsorbed as heat, which is another reason why you don’t want to touch the “paint” either. because you’d change the direction the nanotubes lay and change how they reflect light. Would be interesting to know how it is made if it is real. Making carbon nanotubes is not very difficult if you have the equipment to do it but the result does not look that black, more like pencil graphite. But the tubes need to have a quite high aspect ratio and proper alignment to get the ultra-black effect. I would also expect an electron microscope photo of the resulting nanomaterial, it should also look quite out of this world. I guess they make it by sprinkling the nanotubes to the glued surface of the acrylic in an electric field, which aligns them. Nanohedgehog. Can’t touch this, because the glue barely holds the nanotubes. I agree that he should have gone into some detail as to how he is creating his nanotube array. That being said, there is a pretty high chance that he will deliver exactly what is advertised in the kickstarter, that is a black circle in plexiglass that you can do nothing with. If this is a scam, he probably got his hands on some vantablack and is using that to fill the circles. 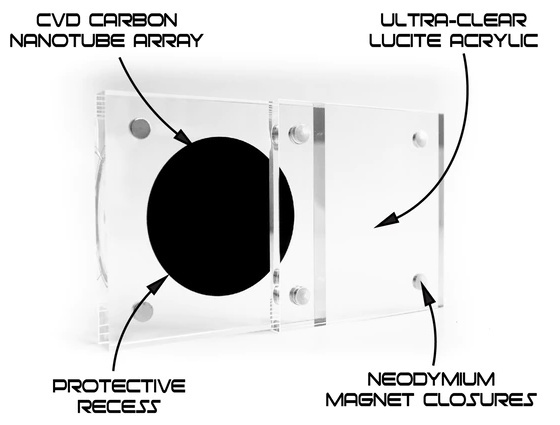 Can anyone here estimate a rough price to make a carbon nanotube array 25mm in diameter? that would probably give more indication if its a scam or just marketing bs that people are falling for. You make some good points, but this project doesn’t seem too complicated, so they may be able to pull it off. Distrusting kickstarters by default is probably the best policy, though. If you want something that’s essentially the same thing, but almost free, do this: light a normal wax candle, and collect soot by placing a object directly in the cool middle of the flame. A piece of heat-resistant glass works great — even a wine bottle or microscope slide. It only takes a second or two, and you can build up a large area of deep black relatively quickly. With a bit of practice you can keep the collecting surface cool enough to not burn off the soot, but warm enough that wax evaporating from the candle doesn’t condense. You end up with the blackest stuff you’re likely to see this side of nanotubes. Totally non-robust though – one touch and the surface is destroyed. >99.9% of the visible light that hits it. Or in other terms, an S11 of -30 dB. My thoughts also Revolver around this sentence. Of all radiation available around me, visible light is only in a small range of wavelengths. So what about absorbing all the rest, as real open space does? No longer wavelengths? Aw, dangit. I wanted to get some radio-black to make my antennas more efficient at absorbing ham radio frequencies! Absorbing the radiation makes it a dummy load, not an antenna. Sort of a “Wile E Coyote” bit of humor, but in an office setting.